The Morgan Station was designed by Ross Barney Architects. Morgan connects two major restaurant rows, one on Randolph Street that stretches much further east at Jefferson all the way west to Racine, and another on Fulton Market that starts at Carnavale (next to the Kennedy Expressway) and stretches to Morgan. Google’s huge new headquarters (under construction) and Coyne College – an HVAC institute – are within walking distance. Item #2 is data that we can see on Licensed Chicago Contractors. To help CTA planners and residents see this information more readily I’ve added all 145 CTA stations as places you can explore from the Places page. How can you use this new place in connection with CTA’s study? With it you’ll be able to easily see building permits issued within half a mile from the CTA station and download this data for the last 9 years. You can also sort by projects’ estimated costs to find the biggest investments near the station. Hosinski admits an important part of the study when she told DNA Info, “the West Loop was showing signs of becoming a booming neighborhood before the station was built…its presence has contributed to the migration of commuters and residents to the area.” Hosinski also said that you’ll find CTA stations at the heart of “most” Chicago neighborhoods and now CTA stations are part of the heart of tracking building permits. 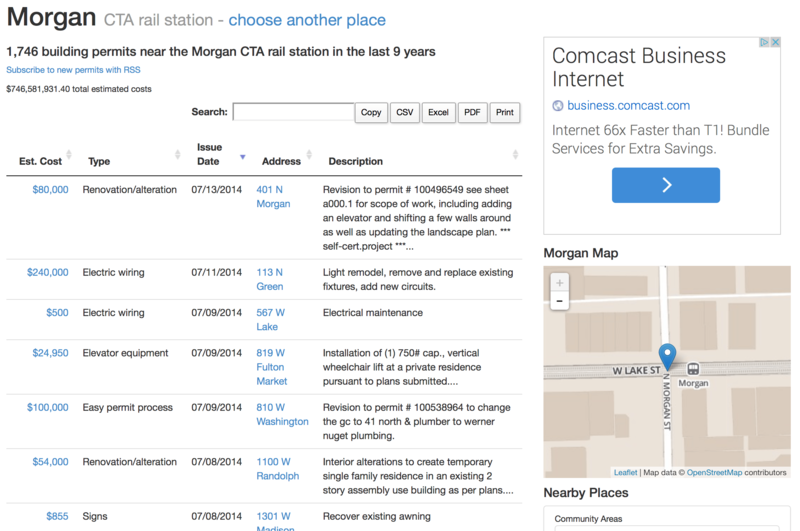 Search for a station name (like Morgan), route name, or click “CTA Rail Station” in the right sidebar. Done! The list is sorted by the permit’s issue date, but click on any of the table headers to sort differently. We’re tracking over 1,700 building permits within a half mile of the Morgan station since July 2005.